In the summertime, I like to make Hawaiian Shoyu Chicken by marinating the chicken in the Shoyu sauce all day and grill on the barbecue. Finishing with a glaze made from the marinade gives a beautiful and delicious finish. Grilling the chicken, instead of slow cooking, would make this a Japanese Teriyaki dish. In the wintertime I like to make my Hawaiian Shoyu Chicken in the crock-pot to cook slowly all day and add carrots and celery towards the end of the cooking cycle and serve over rice. 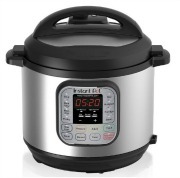 If you want to prepare even quicker, I have also provided Instant Pot cooking instructions. Either way this chicken is Ono (delicious)! Shoyu Chicken is among one of Hawaii’s favourite plate lunches. This dish is a soy sauce (also known as “shoyu” in Japanese) and sweet ginger flavored chicken that will be very tender and easily fall apart with a fork. The distinct cuisine unique to Hawaiian food is a meld of flavors from the island natives and contributions from immigrants from around the Asian rim. Soy sauce is a Japanese flavor staple, where ginger root was added by Vietnamese settlers as one of their contributions to the fusion. Shoyu chicken is wonderful served over rice so the sauce flavors can soak in. A plate lunch typically consists of a scoop or two of rice, scoop of macaroni salad and a saucy meat entree like Hawaiian Kalua Pork or Shoyu Chicken where the sauces can soak into the rice. Plate lunches are considered a Hawaiian staple that derived from the Japanese immigrants who would have cold rice and left over meats for their lunches as they worked in the sugar cane or pineapple fields. More great Poultry Recipes. More delicious Hawaiian food to learn about and and make: Lau Lau Pork, Hawaiian Saimin, Loco Moco, Poke, Shave Ice, and Spam – Spam Musubi. If you want to adjust the quantity of this recipe, make sure that the soy sauce, sugar, and water are equal. * For 1 cup of brown sugar, substitute 2/3 of agave nectar and reduce other liquids in recipe by cup. ** This small amount will not be too hot - just enhance the flavor. **** Cook rice according to package directions. Prepare Marinade/Shoyu Sauce: In a large bowl or large re-sealable plastic bag, combine the soy sauce, brown sugar, water, garlic, onion, ginger root, black pepper, oregano, red pepper flakes, cayenne pepper, and paprika. Add the chicken thighs to the prepared Marinade/Shoyu Sauce. Either cover the bowl with plastic wrap or seal the plastic bag. 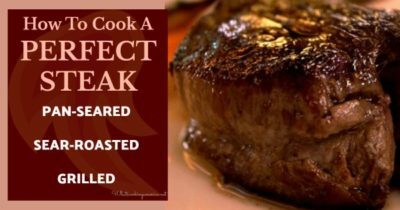 Let marinade in the refrigerator for at least 1 hour or overnight. Preheat barbecue grill for medium heat (spray grill with non-stick vegetable spray). 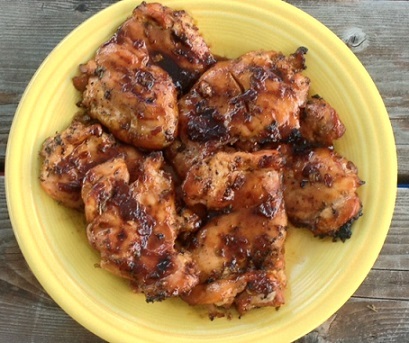 Remove the chicken thighs from the marinade; reserve the marinade to make the glaze (see below). Place the chicken thighs on the hot grill. Cover barbecue with lid and open vents. Grill the chicken for approximately 15 minutes on each side or until a meat thermometer registers an internal temperature of 165 degrees F. (juices will run clear when cut with the tip of a knife). Remove from grill. Brush the prepared Glaze over the grilled chicken thighs before serving. Serve with cooked white rice. Glaze can also be drizzled over the rice. Preheat crock pot/slow cooker on high for 1 hour. NOTE: For food safety, it is a good idea to cook on HIGH for the first hour to quickly bring the temperature up to 140 degrees. Then turn the dial to LOW to cook the chicken thighs. The LOW setting is equal to about 200 degrees F. in the oven. Place the chicken thighs in the preheated crock pot; pour the prepared Marinade/Shoyu Sauce over the chicken thighs. Cook on low temperature for approximately 8 hours or on high temperature for approximately 4 hours. The chicken thighs are done when they are fall apart fork tender. In the last hour of cooking, add sliced celery and carrots; cook until the vegetables are tender. Place chicken thighs in the Inner Pot, then pour shoyu marinade over the chicken. Cover with lid and seal to close. Make sure the pressure valve is also closed. Select Manual button, high pressure and set cooking time for 10 minutes. (Note - If using chicken breasts, cook thinner cutlets for 15 minutes, high pressure and thicker chicken breasts for 30 minutes high pressure.) When cooking time is done, Natural Pressure Release the pressure until the pressure pin drops. Open the lid. To thicken the sauce: in a small bowl stir together 1 1/2 tablespoons of cornstarch and 2 tablespoons of cold water to make a slurry. Remove the cooked chicken pieces to a plate and set aside. Press the Saute button on the Instant Pot and bring to Medium heat setting. Mix in the cornstarch slurry into the shoyu sauce in the pot. Stir together until sauce is thickened. Served chicken over cooked rice and drizzle shoyu sauce over the chicken and rice and enjoy. Dana Zia and her website, Go Lightly Gourmet – History of Hawaii’s Cuisine. Can I make this with a whole chicken? That recipe is Not local style shoyu chicken, far from it. Shoyu chicken only has five ingredients: shoyu, water , garlic, ginger and sugar. I do ‘t Know what that is.